Championing Great British Dairy Farming and Farm Animal Welfare ……We commit to:…All of our cows grazing for at least 120 days a year. Always pay our farmers a fair and leading price for their milk. High animal welfare standards recognised by Compassion in World Farming. 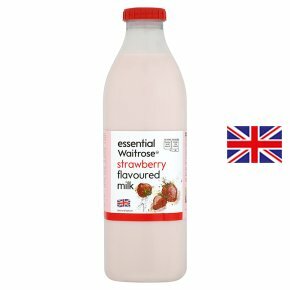 INGREDIENTS: semi skimmed milk (93%), sugar, cornflour, skimmed milk powder, stabilisers (cellulose, sodium carboxy methyl cellulose, guar gum), strawberry juice from concentrate (0.2%), colour beetroot red, flavouring.